PKU is Diet-for-Life. Get back on track and find a PKU Formula you can enjoy drinking. Nutricia Metabolics is proud to offer the largest selection of PKU formulas and flavors. 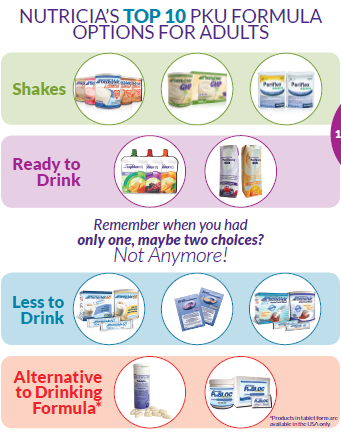 Nutricia also offer free samples* so you can see which product and flavor is best for you. Try 1, try them all! *All samples are verified with a metabolic healthcare professional prior to shipping. All PKU formulas must be used under medical supervision.